In an update to its Long-Term Budget Outlook, the nonpartisan Congressional Budget Office (CBO) warns that the country continues on an unsustainable fiscal path. If current laws remain in place, federal debt is projected to nearly double as a percentage of gross domestic product (GDP) within 30 years — far exceeding its all-time high, which was reached shortly after World War II. Unless policymakers act, CBO concludes that rising debt could jeopardize long-term economic growth, crowd out critical investments, reduce policymakers’ flexibility to respond to unforeseen events, and raise the risk of a fiscal crisis. This dangerous path of federal debt remains a critical issue for our economy, and changes to spending and tax policies are necessary to put the nation on a sustainable path. Federal debt is already at its highest level as a percentage of GDP since 1950 and would exceed its all-time high by 2034 under current law. The outlook would be even worse if CBO had incorporated the extension of recent tax cuts and higher levels of spending into its projections. Rising debt is the result of a structural imbalance between revenues and spending: spending growth (which is fueled primarily by the aging of the population, increasing healthcare costs and rapidly growing interest costs) will significantly outpace the projected growth in revenues. Interest costs are projected to increase sharply, as the debt grows and interest rates rise. By 2026, interest will become the third largest category of the budget, behind only Social Security and Medicare. CBO projects that interest and Social Security will be of equal size as a percentage of GDP at the end of the 30-year projection period. However, since interest is projected to be growing faster at that point, it would surpass Social Security shortly after 2048 and become the largest category of the budget. Rising debt will harm our economy and slow the growth of productivity and wages. To stabilize the debt, changes should be enacted as soon as possible. On our current path, waiting just five years raises the cost of stabilization by 21 percent. By acting now policymakers can lay a strong fiscal foundation for economic growth. CBO estimates that federal debt, which is already at very high levels, will rise significantly over the next 30 years. In CBO’s latest report, debt is projected to climb from 78 percent of GDP at the end of 2018 to 152 percent of GDP at the end of 2048, assuming current law remains the same. That trajectory would be even worse if certain current policies were extended. Debt at that level would be unprecedented. Over the past 50 years, debt has averaged 41 percent of GDP and was just 35 percent as recently as 2007. Since 1790, our debt has only exceeded the size of the economy during a brief time around World War II when it peaked at 106 percent of GDP; after that point, the ratio of debt to GDP fell rapidly. Under CBO’s current projections, that peak would be exceeded in 2034. If alternative assumptions that current policies were extended were incorporated in CBO’s analysis, the debt would be even higher than these levels. For example, if the policies in CBO’s “Alternative Fiscal Scenario” — such as extending all expiring tax provisions and assuming that appropriations grow at the rate of inflation each year from their 2018 amounts — were put in place, debt in 2048 would approach a staggering 200 percent of GDP. Why Is the National Debt Growing? The growth of our debt stems from an underlying imbalance between spending and revenues. Under current law assumptions, CBO anticipates that federal spending will grow from 20.6 percent of GDP in 2018 to 29.3 percent in 2048. Interest alone is projected to be 6.3 percent of GDP in 2048. Revenues are also projected to increase during that period, growing from 16.6 percent of GDP in 2018 to 19.8 percent in 2048, but not nearly enough to match the projected growth of federal spending. More than half of the increase — 4.7 percentage points — stems from increased spending on net interest, which is projected to grow from 1.6 percent of GDP in 2018 to 6.3 percent in 2048. Medicare accounts for 3.0 percentage points of the total growth, increasing from 2.9 percent of GDP in 2018 to 5.9 percent in 2048. Social Security, which is currently the largest federal program, is projected to grow by 1.4 percentage points — from 4.9 percent of GDP in 2018 to 6.3 percent in 2048. Spending on Medicaid, the Children’s Health Insurance Program, and marketplace subsidies would grow by 1.0 percentage point — from 2.3 percent of GDP in 2018 to 3.3 percent in 2048. The sum of spending on all other categories of the budget, including areas such as national defense, transportation, law enforcement, and public health research, is projected to decline by 1.3 percent of GDP through 2048. What Drives the Growth of These Programs? The growth of spending on Social Security and Medicare is driven by two key factors: the aging of the population and increases in healthcare costs per capita. Aging of the population has a slightly larger total effect over the next 30 years as a result of baby boomers entering their retirement years combined with increases in longevity. The number of people age 65 and older is projected to increase by 60 percent, from 53 million in 2018 to 85 million in 2048. Within about 10 years, one fifth of the adult population will be 65 or older. These trends will put significant pressure on the federal budget by driving up spending on programs that primarily serve older populations — in particular, Social Security and Medicare. Aging accounts for almost all of the growth in spending on Social Security relative to GDP, but it is only a partial contributor to growth in spending on the government’s major healthcare programs. The largest driver for the major healthcare programs is growing healthcare costs per person. Although healthcare costs have grown less rapidly in recent years, in part perhaps because of the Great Recession, CBO projects that per-enrollee healthcare spending will continue to grow at a faster pace than GDP per capita. That “excess cost growth” will put upward cost pressure on the federal government’s major healthcare programs, accounting for about two-thirds of their growth between now and 2048. 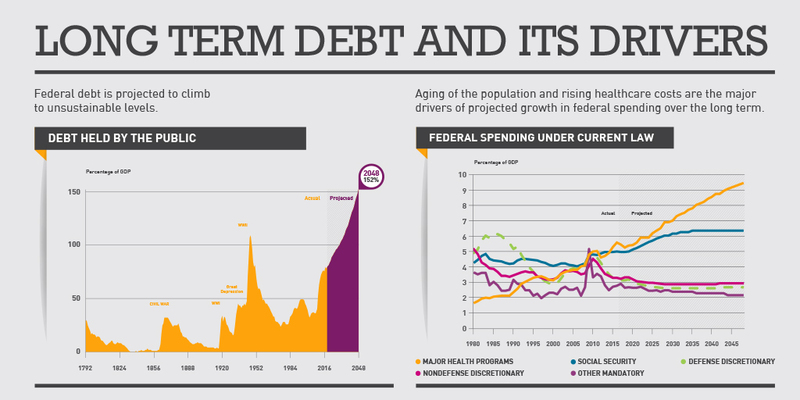 As federal debt increases, interest costs will impose a growing burden on the federal budget. CBO projects that interest payments on the debt nearly quadruple as a percentage of GDP between 2018 and 2048. By 2048, interest is projected to be equal to spending for Social Security, which is currently the largest category in the federal budget. Because interest is projected to be growing faster than Social Security at that point, it would quickly surpass Social Security and become the largest category of the budget. Mounting interest payments will crowd out our ability to fund important priorities. Interest payments are projected to be 1.6 percent of GDP in 2018, which is more than half of what the government has historically spent on R&D, nondefense infrastructure, and education combined. By 2022, interest costs are projected to exceed historical spending on those investments, and by 2043, interest costs are projected to be double the amount historically spent in those areas as a share of GDP. With federal debt on a perilous path, now is the time to make sensible decisions that will improve America’s long-term fiscal outlook. By taking action now, Congress and the President can lay a better foundation for future generations that allows greater investment, promotes stronger economic growth, and assures a more secure safety net. Taking action now would provide time for reforms to be implemented gradually, giving Americans an opportunity to adjust to the policy changes. The longer we wait, the more difficult it will be. Under current law, CBO estimates that for federal debt in 2048 to be no higher than its current share of GDP (78 percent), we would need to cut noninterest spending or raise revenues by 1.9 percent of GDP per year starting in 2019. However, if we waited 5 years to act, the size of these required reforms would grow by 21 percent. In the short term, putting the debt on a sustainable path will reassure financial markets, boost economic confidence, reduce uncertainty, and ease fiscal burdens on future taxpayers. Policymakers can help maintain a strong economy by agreeing on a comprehensive plan to stabilize the debt. Over the long term, a stable fiscal policy would raise wages, bolster family incomes, and enable a more prosperous future. No American wants a future in which our economy is saddled with debt, starved of investment, and struggling to grow. Lawmakers should chart a stable, sustainable fiscal course that ensures widespread prosperity and opportunity for generations to come.